Galvanized pipe and 2x lumber make beefy “industrial” shelves. My four-year-old son may be too young for a man cave, but he’s big on having a “kid cave.” Having outgrown the decorative theme of his baby room (sheep—my wife’s idea), he now favors dinosaurs, Godzilla and other “boyish” things like that. To maintain the rough-and-tough aesthetic he prefers, I installed distressed pine flooring in his bedroom and built him a rustic-looking bed frame from reclaimed lumber. When it came time to install some new shelving, I wanted the addition to match the existing décor. My wife found the inspiration for this project on Pinterest: Simple wood shelving supported by galvanized pipe brackets. Combined with distressed wood and a quality stain, the shelves provide a rugged, industrial look while offering ample storage space. The shelving for this project was cut from simple 2×10 lumber. The 1-1/2-in. thickness of the boards looks nice and beefy on the wall and complements the hefty appearance of the steel brackets. The softwood pine (maybe fir or spruce in your area) is also receptive to distressing the surface, unlike hardwood which is naturally more resistant to showing the aged texture that I wanted to impart. 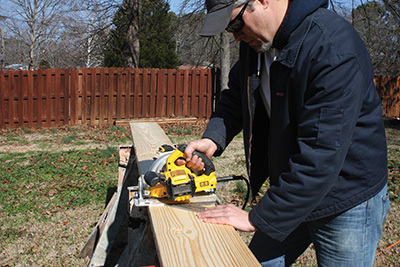 Another advantage of simple 2-by lumber is that it’s inexpensive to purchase. Price is also something to consider when purchasing your pipe and fittings, because the material cost can vary dramatically from supplier to supplier. Galvanized pipe is available in a range of diameters, and each shelf bracket consists of one 10-in. pipe (threaded on both ends), an end cap and a floor flange. I settled on using 3/4-in. pipe for a strong, sturdy look, and each of my four 30-in. shelves required two brackets. This means I needed eight pipes, eight caps and eight floor flanges, the cost of which can add up quickly. When you realize that both Lowes and Home Depot charge more than $11 for a single 3/4-in. galvanized floor flange, the sticker price might even discourage your enthusiasm for the project. It did mine. The shelf brackets are built from ¾” galvanized pipe, end caps and floor flanges. However, with a little telephone research I found a plumbing supplier nearby that was unaffiliated with the large national chains and offered substantially lower prices. For example, at Long-Lewis Hardware in Birmingham, Alabama, I found those 3/4-in. floor flanges for only $3.80 each. By calling around and comparing costs, I was able to cut my expense by roughly a third of the cost. The brackets are painted with Rustoleum Universal Hammered Paint & Primer in One. 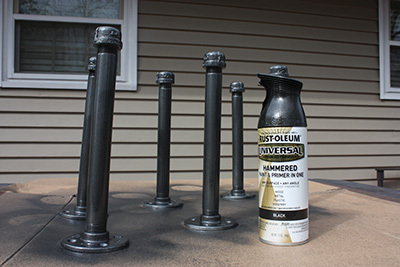 To paint the pipe brackets I used a black Rustoleum spray paint (and primer in one) that offers a special hammered texture to the metal finish. You’ll also need wood stain in your tone of choice, polyurethane for a protective top coat, and heavy-duty screws to mount the brackets into the wall studs. The pipes and fittings have matching threads, so they simply screw together for assembly. I recommend assembling the brackets prior to spray-painting to conceal the “active” part of the threads that would otherwise clog with paint. I also recommend washing the pipes and fittings with water and dish detergent prior to painting. The detergent will cut through any grease or oil on the pipe and promote better paint adhesion. Dry them thoroughly then coat with repeat applications of the metal paint, allowing time to dry between coats, until you’re satisfied with the look and depth of the finish. The hammered paint texture gives the steel a nice “wrought iron” appearance. Paint the screw heads to match. I used #10 x 3-1/8” R4 Screws from GRK Fasteners. To match the brackets I also spray-painted the heads of the screws, which I drove partially into a cardboard box to hold them at a workable height while I coated them. I used #10 x 3-1/8-in. 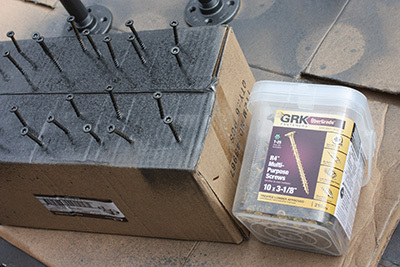 R4 screws from GRK Fasteners, which have the length and strength to fasten securely into the wall framing and support the shelves. I made each shelf 30-1/4” to center between an open bedroom door and closet. The width of you shelves is completely up to you and the design of your home. I went with 30-in. rectangular shelves, which I cut with a circular saw, to position between a bedroom door and a closet. Remember to support the cut-off piece with a roller stand or other work surface so the wood doesn’t tear out as you near the end of the cut. Support the work piece and cut it to size a circular saw. With the shelves cut to size, I then distressed the surface with a variety of tools to give the wood the appearance of age and damage. I hit the boards with a heavy trucker chain to give it dents and dips. A handful of 1/2-in. 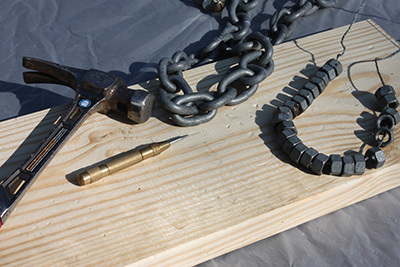 nuts threaded over a heavy-duty wire can be used to whip sharper dents and dings into the surface. A simple punch tool can provide pinholes reminiscent of worm or insect damage. And when used sparingly, the waffle face of a framing hammer can create an interesting relief pattern. I used a variety of tools to distress the wood surface for an aged appearance. 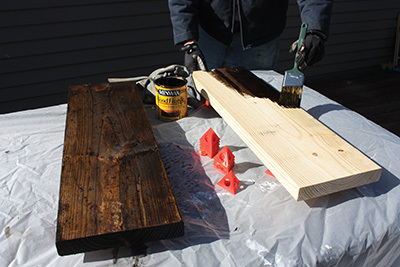 Once you’re happy with the extent of the damage, apply a quality wood stain to the surface. 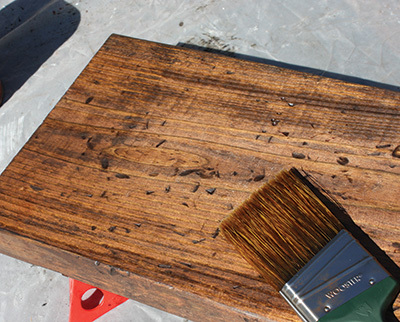 Brush on the wood stain then immediately wipe off the excess with a rag. I chose a dark walnut tone combined with cherry to give the wood an older, woodsy color tone. My tactic is to brush on the stain to cover the shelf on one side, then immediately wipe off the excess before it dies as a thick coat. Then flip and repeat for the other side and edges of the shelf. The tiny holes, scratches and low relief from the distressing process drink up the stain at a greater rate than the flat wood surface and achieve a high color contrast for a weathered, “ancient” effect. I used a combination of cherry and dark walnut to get the color tone I wanted. Once the stain has completely dried, apply a couple coats of polyurethane in your preferred finish (I chose satin). The combined weight of the shelves alone, even before you place anything on them, is substantial enough to rip out of the drywall if improperly installed. I recommend only installing these shelves over wall studs, with two screws per bracket driven at least two inches into the solid wood. My wife and I used painter’s tape to represent the shelf locations as we experimented with placement. 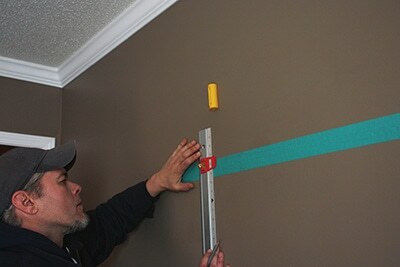 Locate the wall studs with an electronic stud finder and mark their locations. 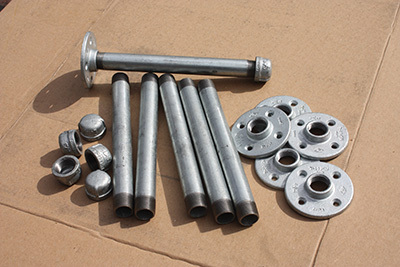 Each galvanized flange contains four screw holes. Orient the flanges so two of those holes fall vertically along the center of the studs. These two stud screws will support the shelf weight, while the other two screws will miss the stud and are basically just decorative in nature. Locate and mark the studs. 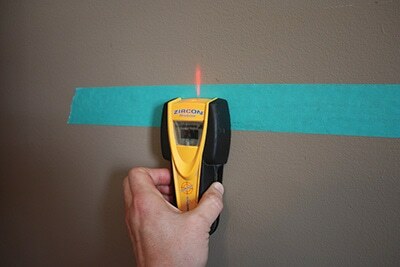 I make pencil marks on the painter’s tape to keep the walls clean. Placement of the shelves is also a personal preference. How many shelves do you want? Do you want the lowest to be located three feet off the floor, or four? How far from the ceiling should the top shelf be mounted, and how much distance should remain between each shelf? Many of these answers will be determined by any existing obstacles you have to work around, as well as the size of the items that you’ll store on the shelves. 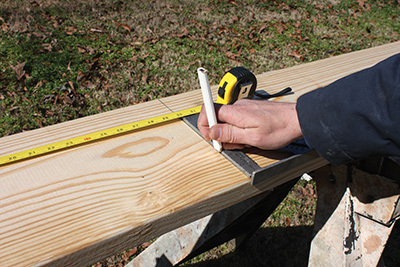 Measure and mark the shelf-bracket locations using the top, center screw holes as your reference points. Decide the location of your top and bottom shelves then divide the remaining space equally to determine placement of the middle shelves. 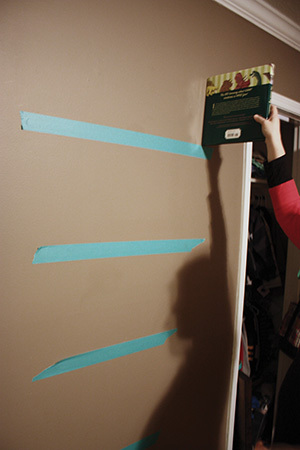 To provide a visual guide for our shelf placement, my wife and I experimented with painter’s tape that we stuck on the wall (and repositioned many times) to represent where the shelves would be mounted. After a little trial and error, we arrived on a plan that made sense for our home. Locate each pair of the brackets the same distance apart and perfectly level. 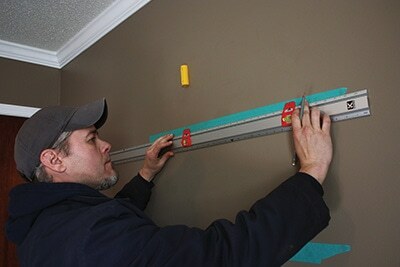 When installing, measure carefully and use a level to double check your placement and ensure the shelves will sit flat. Certain “rules of thumb” exist in interior décor that you may or may not want to consider for your project. For example, it’s generally accepted that vertically stacked shelves look best when spaced equal distances apart. We agreed with this rule and applied it to our project. Here’s another gem: odd number grouping. Considered a “fail safe technique” to decorate an interior, especially when arranging home accessories, this commonly accepted standard suggests that grouping items in an odd number (threes, fives, sevens) will make each piece stand out for a well-organized display. Some people would tell you that even number groupings, such as a pair or group of four, tend to make the group look cluttered. We threw this “rule” right out the window in the name of total anarchy and decided that four shelves struck the right balance of form and function for my son’s room. Bring on the haters. 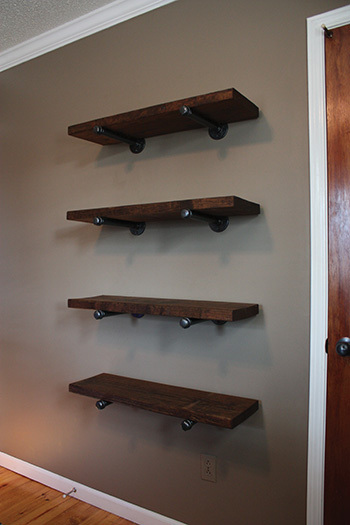 This is a fun weekend project for DIY’ers in search of some hearty rugged shelving. You can knock it out in a day, as well as add to or change the design to reflect your personal taste. Consider the standard rules of interior décor when designing your shelving, but also remember that any of those rules can be broken—because when it comes to your home, you’re the boss.